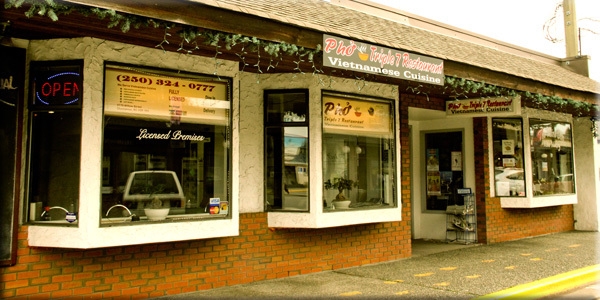 Pho Triple 7 Restaurant is a fully-licensed Vietnamese restaurant that serves customers in Chemainus, Duncan, Ladysmith, Nanaimo and Victoria. Pho Triple 7 Restaurant specializes in naturally flavored, healthy and delicious Vietnamese cuisine. We proudly serve variety of choices for Vietnamese food, especially our traditional bowls of soup (in which Pho is the most popular choice). Each bowl of our soup is carefully prepared and accompanied with fresh coriander leaves, bean sprouts, hot chili peppers, lemon wedges and basil leaves. Our soup also come with many different topping such as steak, meatball, brisket (and more…) to satisfy your very own tastes. At Pho Triple 7, we are committed to go above and beyond our customers’ expectations by providing a comfortable atmosphere, attentive service and superior quality soup and other varieties. Pho Triple 7 is a great choice to health and well-balance meal.